The "Prairie State" has the 5th largest economy in the nation and is considered one of the most attractive states for incorporation. It is home to more than 30 Fortune 500 companies, including international giants such as McDonald's and Boeing. The state's primary industries are based on agriculture, manufacturing, services and energy production (wind power, nuclear power, bio-fuels, coal and petroleum processing). 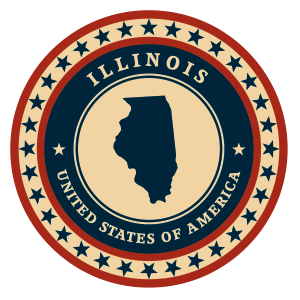 Setting up your US business in Illinois grants many advantages, both practical and financial. Of great importance to most entrepreneurs is the separation that results between private and commercial assets and liabilities: your personal wealth can't be used to clear any debts that your business builds up, and any business failure will have no bearing on your personal financial circumstances. This makes incorporation highly sensible for entrepreneurs with existing private assets they don't want to ply into the business. Additionally, forming a corporation in Illinois will enable non-US residents to open a bank account with a major US bank. This can help in many aspects of business, from ease of accounting to accessing online programs such as vendor accounts operated by Amazon, Ebay and so on. Finally, being able to present yourself as an incorporated company can greatly enhance your organisation's credibility, potentially leading to increased customer trust and thus more sales. For your corporation name to be compliant, it must be unique, and this is an opportunity to strengthen your brand. We can help you select, register and protect your unique brand name during the incorporation process. There is no legal requirement for an Illinois company to have state-resident owners or directors, and even living overseas is no bar to incorporation. C-Corps and LLCs in Illinois must have at least one member, and the incorporator or organizer must be a natural person of age eighteen or over. The type of business entity you choose to operate in Illinois determines the nature of the taxes you will be liable for. The state assesses taxes on C Corporations based on their corporate revenue; taxes for LLCs are by default determined by members’ personal income, but you can elect for your LLC to be taxed as a C Corp or a partnership should you wish. C Corporations are taxed an annual corporate tax at a rate of 7% based on net income. C Corps must also pay a personal property replacement tax based on individual net income. The tax rate for C Corps is 2.5%. Additionally, all business entities must pay a “personal property replacement” tax. In Illinois, LLC names must be unique and should end with the term “Limited Liability Company”, or the abbreviations “LLC” or “L.L.C.”. Dashes are not permitted. Similar restrictions apply to C Corp naming. The organization names allowed in Illinois must include one of “Company”, “Corporation”, “Incorporated”, “Limited”, or their abbreviations. The incorporation name must not suggest any insurance, assurance, banking or indemnity services, nor acceptance of savings deposits or corporate fiduciary. For both LLCs and Corporations, the terms “Bank”, “Trust” or similar require approval from the Department of Banks and Trusts. If you decide to form an LLC in Illinois then you are required to file Articles of Organization with the state, including the name and address of a registered agent who holds state residency. Additionally, Illinois-based LLCs are required to file an annual report before the anniversary month of incorporation. The filing fee for the annual report is $250. In order to form a C Corporation in Illinois, you must also file an Articles of Incorporation, although in this case the document must contain details of authorized shares as well as those of the registered agent. C Corporations also require ongoing filing of an annual report. We can help with preparation of all documents for both LLCs and C Corps. In Illinois, LLC names must be unique and are allowed to end with the terms “Limited Liability Company” or the abbreviations “LLC” and “L.L.C.”. Dashes are not permitted in the incorporation name. The words “Bank”, “Trust” or any variations need a special approval from the Department of Banks and Trusts. If you decide to form an LLC in Illinois then you are required to file Articles of Organization with the state. Additionally, Illinois-based LLCs are required to file an annual report before the anniversary month of incorporation. The filing fee for the annual report is $250. The name and address of a registered agent who resides in Illinois and who is available to manage legal and tax business documentation, must be included in the Articles of Organization. For help with filing documents or finding registered agent services feel free to contact Inc. Plan (USA). For tax purposes, Illinois LLCs will be taxed either as partnerships or C Corporations. The organization names allowed in Illinois must include the terms “Company”, “Corporation”, “Incorporated” or “Limited”, along with their abbreviations. However, the use of dashes is not approved. Additionally, the incorporation name must not suggest any insurance, assurance, banking or indemnity services. Also, it must not imply acceptance of savings deposit or corporate fiduciary. The terms “Bank”, “Trust” or any variations need approval from the Department of Banks and Trusts. In order to form a corporation in Illinois, entrepreneurs must file an formation document called Articles of Incorporation along with an annual report. The Articles of Incorporation are required to list of the company’s authorized shares. The Articles of Incorporation must also include the address of a registered agent with a physically located in Illinois. Increases in the share stock may affect the initial filing fees. Inc. Plan (USA) can help you with the necessary filings and with providing qualified registered agent service. C corporations are taxed at an annual corporate tax at a rate of 7% based on net income reported to the IRS. C corps must also pay a personal property replacement tax based on individual net income. The tax rate for C corps is 2.5%.